Few would debate legendary martial artist Chuck Norris’ ability to take out any opponent with a quick combination of lightning-fast punches and kicks. Norris, after all, is legendary for his showdowns with the best of fighters and being the last man standing in some of the most brutal and memorable fight scenes. It’s no surprise, then, that hackers named one of their most dubious botnet attacks after “tough guy” Norris, which wreaked havoc on internet routers worldwide. The “Chuck Norris” botnet, or CNB, was strategically designed to target poorly configured Linux MIPS systems, network devices such as routers, CCTV cameras, switches, Wifi modems, etc. In a study on CNB, the University of Masaryk in the Czech Republic, examined the attack’s inner workings and demonstrated how it employed Netflow as a countermeasure to actively detect and incapacitate the threat. Lets look at what gave CNB its ability to infiltrate key networking assets and how, through flow-based monitoring, proactive detection made it possible to thwart the threat and others like it. What made the Chuck Norris attack so potentially devastating? What made the CNB attack so menacing was its ability to access all network traffic by infiltrating routers, switches and other networking hardware. This allowed it to go undetected for long periods, whereby it was capable of spreading through networks fairly quickly. As Botnet attacks “settle in”, they start issuing commands and take control of compromised devices, known as “bots”, that act as launch pads for Denial of Service (DoS) attacks, illegal SMTP relays, theft of information, etc. In the case of the CNB attack, Netflow collection data revealed how it infiltrated devices on TELNET and SSH ports, DNS Spoofs and web browser vulnerabilities, enabling Security teams to track its distribution on servers to avoid further propagation. 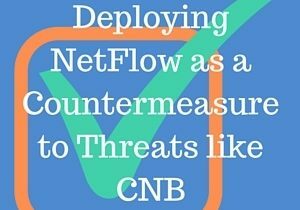 Netflow’s deep visibility into network traffic gave Security teams the forensics they needed to effectively detect and incapacitate CNB. Analysts are better positioned to mitigate risk to the network and its data through flow-based security forensics applied at the granular level coupled with dynamic behavioral and reputation feeds. Only with sufficient granularity and historic visibility can the risk of an anomaly be better diagnosed and mitigated. Doing so helps staff identify breaches that occur in real-time, as well as data leaks that take place over a prolonged period. Flow-based monitoring solutions can collect vast amounts of security, performance and other data directly from networking infrastructure, giving Network Operations Centers (NOCs) a more comprehensive view of the environment and events as they occur. In addition, certain flow collectors are themselves resilient against cyber attacks such as DDoS. NetFlow technology isn’t only lightweight in terms of resource demands on switches and routers, but also highly fault-tolerant and limits exposure to flow floods including collection tuning, self-maintaining collection tuning rules and other self-healing capabilities. As a trusted source of deep network insights built on big data analysis capabilities, Netflow provides NOCs with an end-to-end security and performance monitoring and management solution. For more information on Netflow as a performance and security solution for large-scale environments, download our free Guide to Understanding Netflow. Cutting-edge and innovative technologies like NetFlow Auditor delivers the deep end-to-end network visibility and security context required assisting in speedily impeding harmful attacks.